“On Saturday 28 May 2016, Abbie was admitted to the Alex with a fever, strange rash and a very swollen gland in her neck. She had been scratched on the face by our kitten a few weeks earlier, and the first thought was that it had become infected, causing the symptoms. Abbie was taken to the ward and antibiotics were administered by IVG. 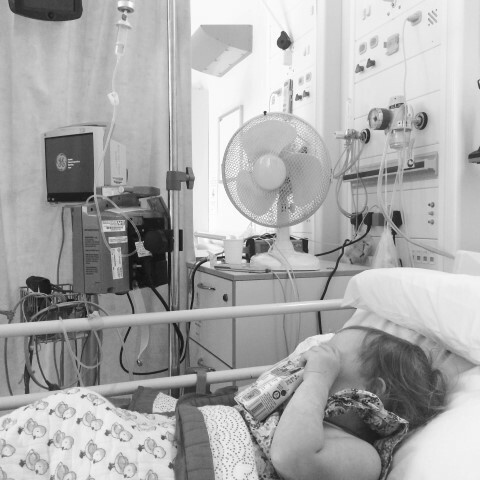 We spent the evening watching the final of Britain’s Got Talent – it was a bank holiday, and it wasn’t how we expected to be spending it – but she would be home in 48 hours when the antibiotics had done their job. On Sunday, Abbie was up and about, even playing with her brother and sister when they came to visit, but her temperature kept spiking and the rash was still present. Abbie had her glands checked for fluid; I was so worried she’d have to have a general anesthetic to drain it – but the scan came back clear. Abbie’s temperature continued to spike throughout the night, reaching temperatures of over 40 and she was monitored every hour. As Abbie’s symptoms continued and the antibiotics failed to work, the doctor told us it was suspected Kawasaki disease, and they would start the treatment the next day. The treatment for Kawasaki is an intravenous immunoglobulin, administered by drip over 10 hours. After three hours, Abbie was sitting up, her temperature was going down, and she also managed to eat a sandwich, it felt like a wonder drug! Abbie continued to do well on Wednesday but was refusing to take the aspirin, which is a crucial part of recovery from Kawasaki Disease. Thursday morning the doctor looked us in the eye and told us our daughter could die if we didn’t get the aspirin inside her – children with Kawasaki Disease are at risk of heart problems and our beautiful little toddler could potentially have had a heart attack. The nurses tried so hard to get her to take the aspirin, the special Theodora clown doctors tried, and even the child psychologist tried – everyone was so patient and kind – especially the nurses who were so wonderful looking after not only Abbie but me and her Dad too. On Thursday afternoon, an echo and ECG showed some inflammation of the arteries around her heart – this knocked us sideways – but everyone at the Alex was so supportive. They continued trying to administer the aspirin to Abbie, and she was sedated twice to insert a tube in her nose, but this failed both times. On Friday a decision was made to swap to another drug taken by IVG once a day for three days. Suddenly everything became much calmer, and we were able to take Abbie home on Monday. We continued with her meds at home for the next six weeks. Abbie has been back to the Alex for two further ECG’s and Echo’s, and she was given the all clear at the last one. Without the wonderful doctors and nurses at the Alex, it could have been very different. Abbie got the all clear and was discharged from hospital care in October 2016.